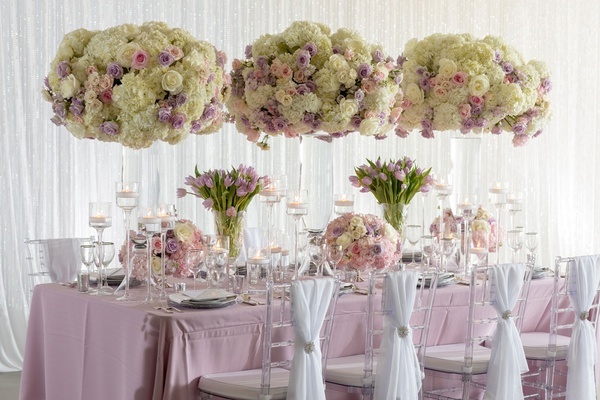 The eight-seat table showcased gorgeous high and low floral arrangements that were placed atop the petal-colored linen. 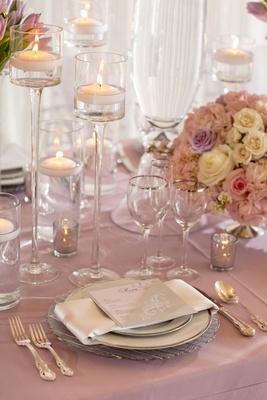 Three of the billowing centerpieces were placed in tall glass vases, and the others stood in miniature silver vessels. 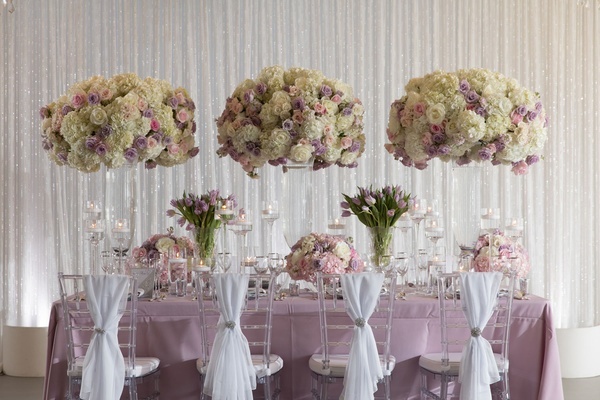 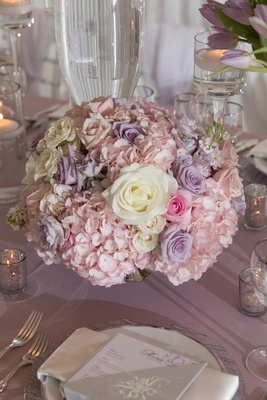 Each arrangement incorporated white and pink hydrangeas with lavender, blush, and white roses, which stood out when placed in front of the white drapery that doubled as a backdrop. 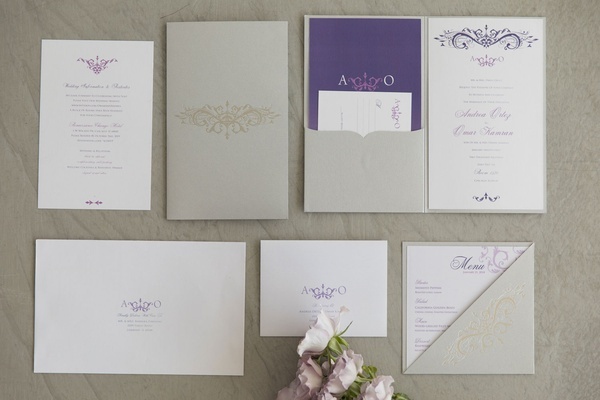 “The variation in height worked beautifully and created a classic layering effect,” the planner describes. 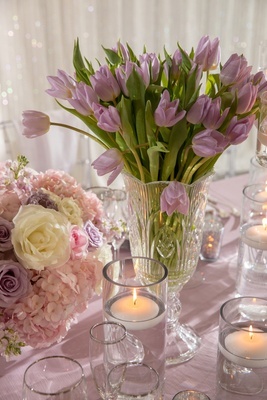 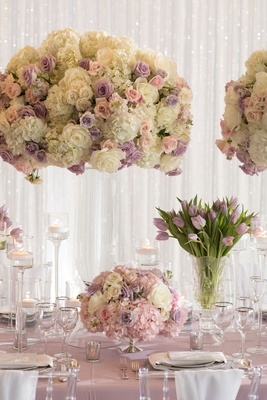 The table also featured bundles of lavender tulips in true spirit of the springtime ambience, along with a plethora of floating candles that complemented the two dazzling crystal chandeliers. 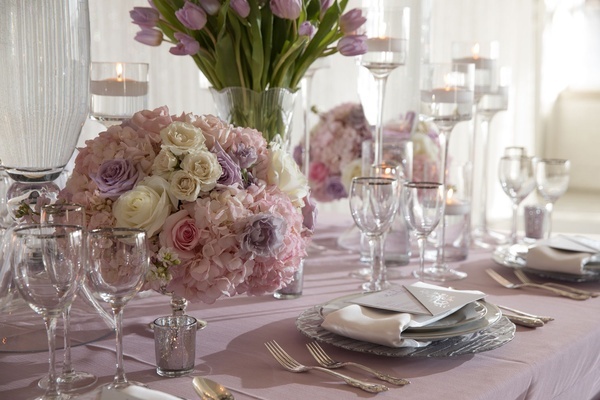 “Alternating between each arrangement were a display of stemmed candle holders showcasing floating candles to add the perfect touch of romance,” she adds. 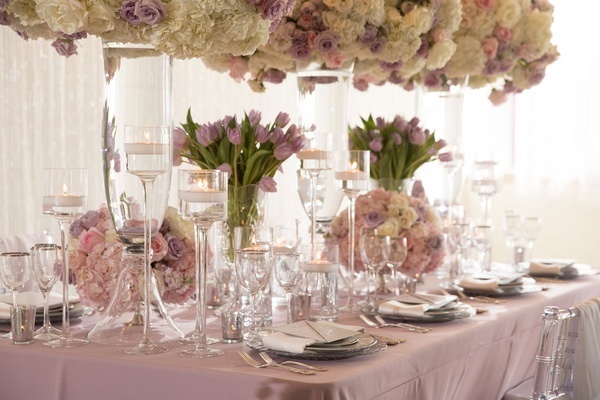 The customized menu cards highlighted the lavender and silver shades of the color palette and beautifully enhanced the exquisite look of the table. 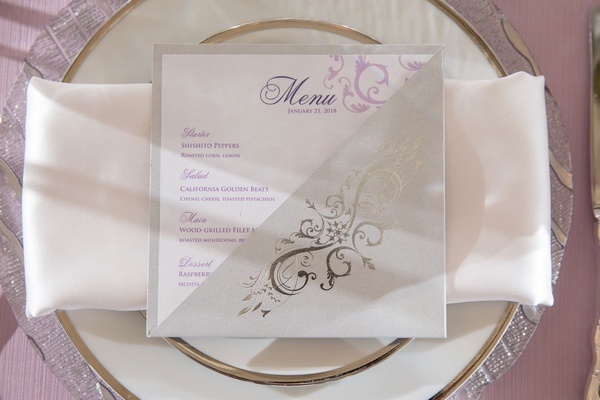 “The menu cards, combined with the white lamour napkins, silver-rimmed glassware, and silver ribbon charger plates, worked perfectly together,” she says. 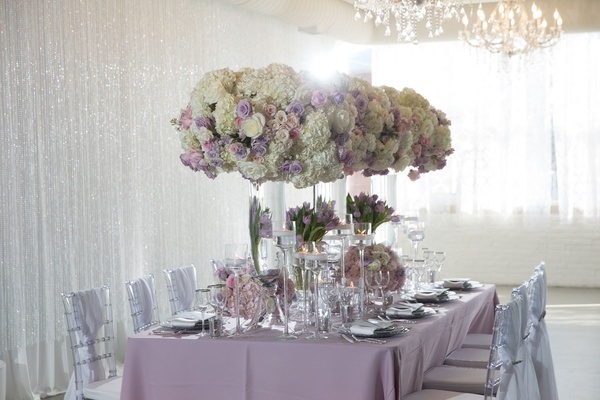 The planner also decided to decorate each chair with white linens and glimmering accessories, which paired perfectly with the drinkware and chandeliers. 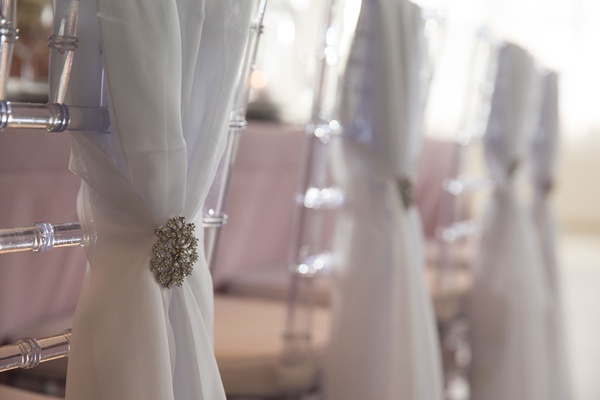 “Clear chiavari chairs were accented with white sashes adorned with crystal brooches,” she recalls. 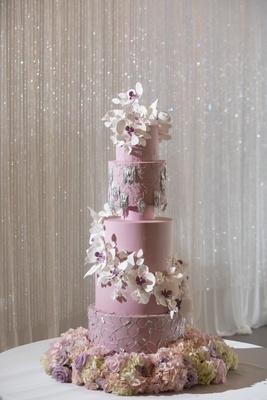 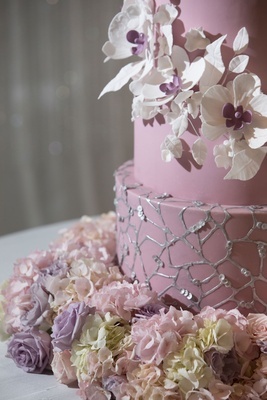 The style of the shoot was complete with a whimsical confection designed by a Chicago baker. 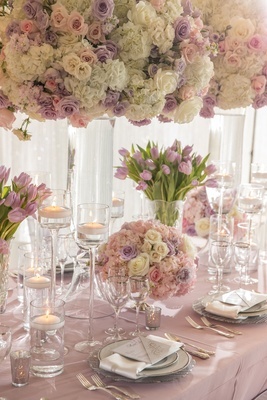 It showcased eye-catching silver accents that mimicked fabric, cascading decorative flowers – the same blooms featured in the centerpieces, and five tiers matching the hue of the table linen. 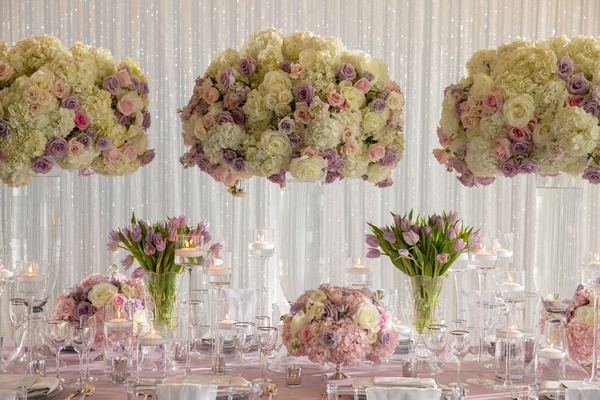 From the sophisticated color palette to the incorporation of blooms and dazzling ornaments, all of the details meshed beautifully together to create a stylish springtime wedding ambience; however, the design style is certainly fit for weddings of all seasons.